Peoples’ Self-Help Housing celebrated new affordable housing with development partners, donors and residents at the Casas de Los Carneros Grand Opening on September 19 in Goleta, CA. More event photos. 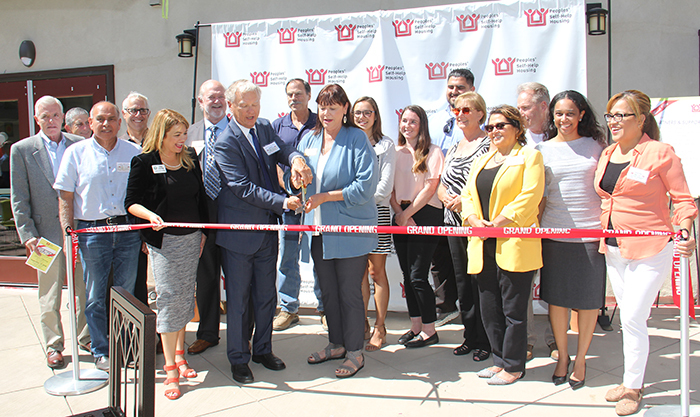 Goleta, Calif., September 28, 2018 – Peoples’ Self-Help Housing (PSHH) was joined by over 110 development partners, funders, elected officials, residents and members of the community for the September 19 grand opening celebration of Casas de Los Carneros Apartments in Goleta. Casas de Los Carneros (CDLC) is the affordable housing component of The Village at Los Carneros, a new Master Plan development by Comstock Homes located off Los Carneros Road near U.S. Highway 101. Offering 70 rental units that vary in size from one to three bedrooms for households earning no more than 60 percent of the area median income, CDLC features a community center, outdoor recreation spaces, playground, half basketball court, community garden and laundry facilities. CDLC also houses PSHH’s latest Learning Center offering free after school tutoring, college prep support and classes for adults. PSHH’s 16-year-old Education Program offers free site-based services through 11 Learning Centers located at rental developments throughout the Central Coast from Carpinteria to Paso Robles with two more scheduled to open by the end of this year. For more information about this program visit www.pshhc.org. Funding agencies included the City of Goleta, Chase, Goleta Valley Housing Committee and Merritt Community Capital. Development partners include Comstock Homes, Carl Schneider & Associates, Stantec, Landscape Architect Robert Andrew Fowler and Interiors by Adele.